zaghaghi wrote: I started coding, first a gui about where you,peach team, want volumetric material, and what options do you suggest to be here? I find this a difficult approach... you might better first design or define a system, and then design the UI for it. ton wrote: I find this a difficult approach... you might better first design or define a system, and then design the UI for it. you're right, i stopped coding like that, but i have a question that asked it at previous Sunday meeting, that is, should Blender do things like cloud generation? 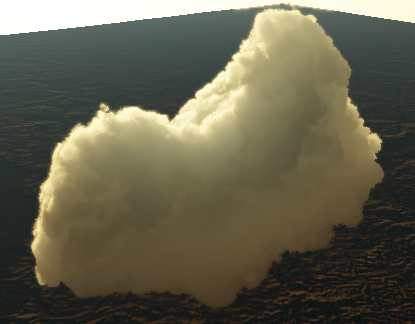 I think that blender is a general purpose 3d modeling and it's may not necessary to do things like cloud generation, some single purpose applications like bryce do this, but i think we should make for example some volumetric materials, that can be used by artists for making clouds. by the way i think that for a simple start i can add volumetric halo to current halo system, that generate random halo points in mesh, with some parameters like density. or don't start coding, and make a specification and design first. zaghaghi wrote: ...that generate random halo points in mesh, with some parameters like density. This method can be done actually with the new particles, but I don't think thi´s a good way (slow and hard to setup). I think we need a good volumetric shader, instead of use multiple overlapped halos. "Some Day, All Will Be Digital"
a more generalist approach is certainly desireable - ie volumetric particles that can, among other things, be used for clouds would be quite useful. Your question wasn't quite clear at the meeting. @zaghaghi: how are things going with this project? I haven't heard about this for a while. 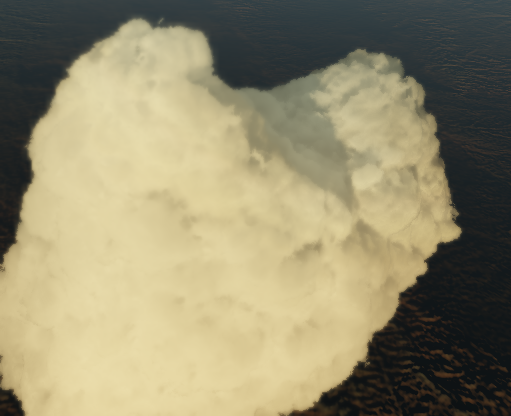 Realistic clouds in blender is certainly possible. No particles, no ray-tracing. Just camera-tracked planes with a few layers of procedural textures. Render time on my quad core at HD resolution is 30 seconds. The downside is that you can't interactively see your clouds, you must render to preview. There are 3 texture layers. 1)Cloud color and alpha 2) A blend sphere that smooths the edges of each individual billboard. 3) A "cloud darkening" blend that darkens each billboard depending on its Z location. I created the grid by subdividing a cube and then removing doubles with a high limit value to evenly space the points. Then I created one billboard object and dupliverted it. Upon setting dupliverts to real, you can make them all track the camera. The camera tracking step is the most important, as it lets you view the clouds from any angle. It calls it faking, but from what I have tried, you can do mists, clouds, fogs, even thick smoke plumes, just by varying a few things. You can use it already in Blender with a simple Composition Node thingie. I don't know much about the deeper arts of Blender coding, but that makes me think it would be far easier than doing it from scratch. http://www.crispquality.com/monkey/ - The production log for the upcoming Blender movie "Siberian Complex"
Thi´s the same as the Mist in Blender WORLD window (very basic) The examples RipSting showed, while not perfect are far better. It is real-time clouds rendering so maybe inspiring for really fast off-line rendering. Even more objects can cast shadows on the clouds, and clouds can cast shadows on other objects and on themselves. Authors are students from Grenoble university, maybe they would like to help Peach coders. PS: Thank to Cybor Dragon from BlenderArtists for this hint. 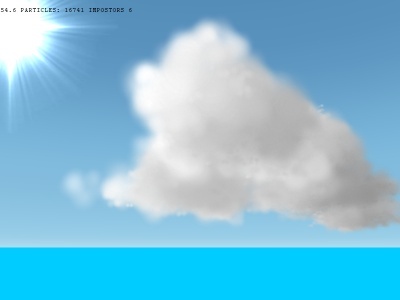 I've taken it upon myself to code my volumetric cloud solution. Recently, I developed a technique to fake volumetric clouds using Subsurface Scattering and Nodes. I hope this can be useful for someone.